I am semi-retired and a lifelong resident and lover of Sydney. I enjoy wandering around the countryside, usually carrying a camera. When I was a child, far too many decades ago, my family used to drive up to the Northern Beaches past Narrabeen Lakes. I still remember seeing what seemed, to my 5 year old eyes, to be vast flocks of black swans living on the Lake. Those flocks dwindled. I am not sure when they disappeared, but sightings have been rare for decades. For many years sightings of swans were confined to a single pair that appeared in late winter. Three or four years ago I saw what seemed to be a family group of six near where Deep Creek emptied into the Lake. It seemed that the population had finally started growing. A few weeks ago Warringah Council completed the last link in a walking and bike track around the Lake. I checked it out recently and found a flock of over fifty swans resting on a sand spit on the southern shore of the Lake near South Creek. 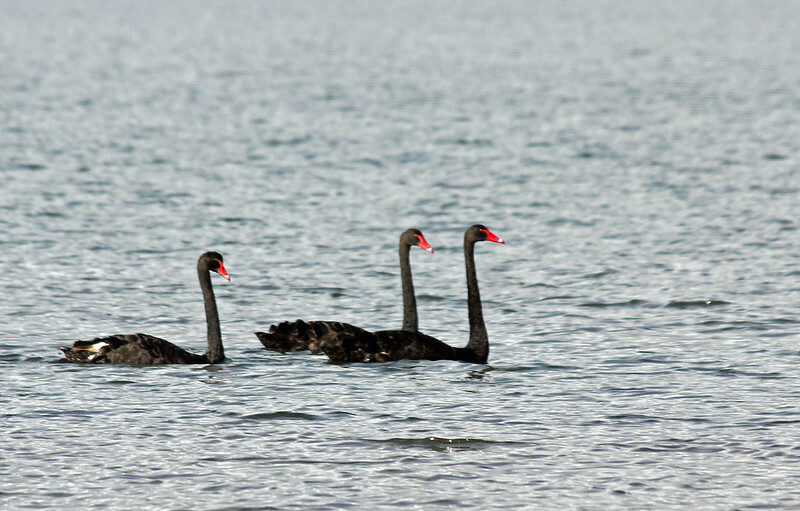 Word seems to be out in the black swan world that Narrabeen Lake is a good place to hang out again. The flock is now big enough that you should see at least a few as you walk by the Lake. I have usually seen them between Deep Creek and South Creek. As well as swans you can expect to see pelicans, ducks and cormorants, and there is a reasonable chance that you could see great egrets, darters, spoonbills and white faced herons. The path is flat or gently graded. It is accessible from many points but the car park at Middle Creek, off the Wakehurst Parkway at Elanora, or Lakeshore Drive at Cromer are convenient.